Splendour’s A-Team of 2017 is a heterogeneous collection of artists that spans the musical rainbow, from prolific rock superstars and indie electro pioneers to hip hop innovators and national icons alongside our freshest new crop of Australian stars on the rise. Three days of all ages, magical music moments await! Plus so much more…. So, to the important news... Who’s playing? ​When it’s time to rest your weary bones, camping on site is the way to go for the full Splendour emersion experience and we have a variety of options available. The camping area closest to the event site is vehicle free but you can camp with your wheels in other areas. For the time being you only need to purchase your event and camping ticket. You’ll be able to choose where you want to park your rig when we release vehicle passes on Monday 8 May. Onsite camping is available for up to 5 nights – with early entry into the campgrounds available from Wednesday 19 July – so bunk in for an easy and affordable way to experience Splendour. Travelling from afar and not keen to lug your camping kit? Pack light and book yourself into Tepee Love, Flash Camp, Tent City or Byron Bay Camping Hire. Bringing the kids? The Meadow, our family friendly campground is the place for you! Remember you will need to purchase a vehicle pass for the day you want to arrive, available Monday 8 May. 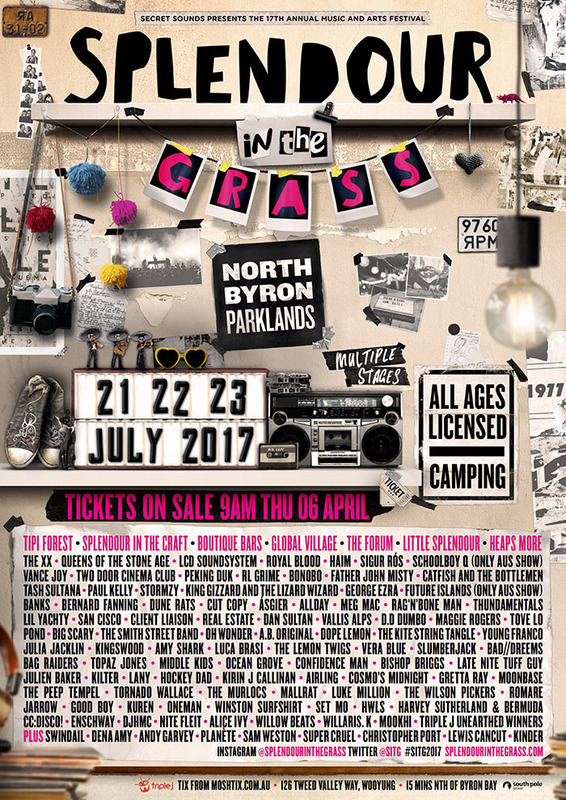 You can find more information about camping and vehicle passes at splendourinthegrass.com. We’ve made some changes and improvements to our onsite traffic management to ensure it’s a smooth experience for everyone so if you’re being dropped off at the festival each day, please be sure to use the drop off points inside the venue only. Tweed Valley Way and the Pacific Highway are ‘no-go’ zones, please be safe and stay off busy roads. This year Splendour is working with South Pole Group which recently acquired our long term carbon offset partner Climate Friendly. South Pole Group is one of the world’s leading sustainability solutions providers and if you choose the carbon offset option when purchasing your tickets, they will invest your $$ in projects to reduce carbon emissions. To manage traffic and create a greener event, we will again be implementing a vehicle pass system that will encourage carpooling, please see the ​Splendour in the Grass website for more detailed information. Keep your eyes on Splendour in the Grass and our Facebook page for more details.